The Chōshū Domain (長州藩, Chōshū han) was a feudal domain of Japan during the Edo period (1603–1867). It occupied the whole of modern-day Yamaguchi Prefecture. The capital city was Hagi. The name Chōshū was shorthand for Nagato Province. The domain played a major role in the Late Tokugawa shogunate. It is also known as the Hagi Domain (萩藩, Hagi han). 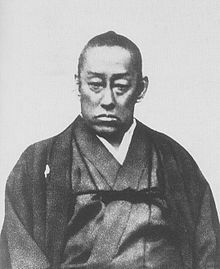 His cousin Kikkawa Hiroie secretly made a deal with Tokugawa Ieyasu resulting in the inactivity of 15,000 Mōri soldiers during the battle. His adopted cousin Kobayakawa Hideaki and his 15,600 soldiers betrayed Ishida and joined the Tokugawa side. After assurances from Tokugawa Ieyasu, Terumoto gave up the formidable Osaka castle without a fight. Despite its inactivity, the Mōri clan was removed from its ancestral home in Aki to Nagato Province (also known as Chōshū), and its holdings were drastically reduced from 1,200,000 to 369,000 koku. This was seen as a great act of betrayal to the Mōri clan, and Chōshū later became a hotbed of anti-Tokugawa activities. The origins of this were evident in the tradition of the clan's New Year's meeting. Every year during the meeting, the elders and the administrators would ask the daimyo whether the time to overthrow the shogunate has come, to which the daimyo would reply: "Not yet, the shogunate is still too powerful." This dream would eventually be realized some 260 years later, when the domain joined forces with the Satsuma Domain and sympathetic court nobles to overthrow the Tokugawa shogunate. In 1865, the domain bought a war-ship Union (ja) from Glover and Co., an agency of Jardine Matheson established in Nagasaki, in the name of Satsuma Domain. They led the fight against the armies of the former shōgun, which included the Ōuetsu Reppan Dōmei, Aizu, and the Ezo Republic, during the Boshin War. The domains' military forces of 1867 through 1869 also formed the foundation for the Imperial Japanese Army. Thanks to this alliance, Chōshū and Satsuma natives enjoyed political and societal prominence well into the Meiji and even Taishō eras. The Chōshū Kiheitai fought against the shogunate in the Second Chōshū expedition and the Boshin War. All retainers' fiefs were drastically reduced. Some retainers who were paid in land began to be paid in rice. Some retainers were laid off and encouraged to engage in agriculture. Previously, as a result of high taxation, farmers secretly developed farms far inside the mountains as a private food source. A new land survey was conducted within the domain in which many hidden farms were discovered and taxed. The domain also began a strict policy with regard to trade. Laws were also passed through which the profitable trade of the "four whites" was controlled by the domain: paper, rice, salt, and wax. Some of the profits, and a large amount of the tax revenue from this trade, went into the domain coffers. These policies greatly strengthened the domain's finances and allowed the daimyo more effective control over his territory. However, these policies angered peasants and displaced samurai alike, resulting in frequent revolts. The capital of the domain was the castle town of Hagi, which was the source of Chōshū's alternate name of Hagi han (萩藩). Iwakuni han: 60,000 koku, ruled by descendants of Kikkawa Hiroie. Chōfū han: 50,000 koku, ruled by descendants of Mōri Hidemoto. Tokuyama han: 40,000 koku, ruled by descendants of Mōri Naritaka. Kiyosue han: 10,000 koku, ruled by descendants of Mōri Mototomo. During the Edo period, the main branch died out in 1707, after which heirs were adopted from the Chōfu branch, which also became extinct in 1751. The family then continued through the Kiyosue branch. The Mōri daimyo, as with many of his counterparts throughout Japan, was assisted in the government of his domain by a group of karō, or domain elders. There were two kinds of karō in Chōshū: hereditary karō (whose families retained the rank in perpetuity) and the "lifetime karō", whose rank was granted to an individual but could not be inherited by his son. The hereditary karō were either members of minor branches of the Mōri family, or members of related families such as the Shishido and the Fukuhara, or descendants of Mōri Motonari's most trusted generals and advisors such as the Mazuda, the Kuchiba and the Kunishi. The lifetime karō were middle or lower samurai who displayed great talent in economics or politics and were promoted to karō by the daimyō. One such person was the great reformer Murata Seifu. IV. Yoshinari, 4th Lord of Chōshū (1668–1694; r. 1682–1694). XIII. Naritō, 13th Lord of Chōshū (1815–1836; r. 1836). Nomura Yakichi, later Inoue Masaru (1843–1910), "father of the Japanese railways"
Yamagata Isaburō (1858–1927), Nephew of Yamagata Aritomo, Minister of Communications,and first Japanese Inspector-General of Korea. Sone Arasuke (1849–1910), politician, diplomat, cabinet minister, and second Japanese Resident-General of Korea. Ōmura Masujirō (1824–1869), "Father of the modern Japanese Army"
^ a b Deal, William E. (2005). Handbook to Life in Medieval and Early Modern Japan, p. 81. Bakufu seichō kiroku 幕府征長記錄 (1973). Edited by Nihon Shiseki Kyōkai 日本史籍協會. Tokyo: Tokyo Daigaku Shuppankai. Ogawa Ayako 小川亜弥子 (1998). Bakumatsuki Chōshū-han yōgakushi no kenkyū 幕末期長州藩洋学史の研究. Tokyo: Shibunkaku Shuppan.